Here as in Trevor's other story collections, one spark of reality can shrivel the cocoons of quiet lives. "Angels of a kind we were" croons a husband-swapping exurban housewife, as she reconstructs that evening-at-the-Ritz when they were laughing, poor and young. 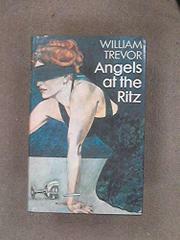 Yet the fallen angel is not the speaker, but her best friend who within the "shell of middle age" just doesn't care that much when her husband discreetly goes astray: "You couldn't forever laugh among the waiters at the Ritz just because it was fun to be there." In another tale, a plain mouse seduced by the office rat reminds a back-street business woman of her 23 years of being used by the man she loves. Time after time, cruelty comes as naturally as the grass which is slowly obliterating the tennis courts restored for an elderly widow's last party: in the renunciation of parents by their young; in village bigotry kept alive by national hatreds; in the savagery of war. But there are those who can learn to last out despair, like the unloving couple joined in a shotgun marriage: "there was [now] nothing that could be destroyed, no magic or anything else." Even Trevor's least imaginative pieces are neatly joined; he offers biting insights as well as the sad echo of the nightingale which once sang in Berkeley Square.